In February 2017, 14,000 residents in my hometown—none of whom I’d met personally—were mandatorily evacuated from their waterlogged homes. Knowing my San Jose roots, work colleagues lean over my laptop, offering me misplaced condolences. An East Coast friend texts me You good? Staying dry? I check in as safe in the San Jose floods when a Facebook alert prompts me to, and friends click like on the automated status update. I think flood when I vacate the bathtub. I think flood when my soup spoon fills with pho. I think flood when a bottle leaks in my tote bag, warping my books with spilled liquid. ​I think flood but I never feel flood, and that is a crucial distinction. When the news is of prosperity, my city gets called Silicon Valley. When the news is of disaster, it’s called San Jose. On Caltrain that week, I eavesdrop on four visiting tech bros. They swig craft beers at a table, knees spreading out in the aisles, while bragging how they’ll make 6 figures this year at their 10 week summer internships. Let’s be honest, I wanna get rich, one says. They laugh in loud unison over an older acquaintance who got fired from his internship for sharing hot nudes of his girlfriend at a work bash. Now he’s a venture capitalist. I search for evidence of souls in my co-passengers, something to spark my lost empathy. What would it take to crack this veneer so that floods can seep in and alarm them? Seriously though, one of them says, eying his emptying bottle, who gets bored of breweries? No one. I am unsure which watering hole they’re headed to next, but I project myself into two busy taprooms that border the Rock Springs neighborhood, a Latinx and Vietnamese immigrant community hit hard by the floods. These bros will just keep on guzzling, I predict. A dark part of me hopes they all drown. On the mayor’s website, I skim a continuously updated list of companies that donated to flood relief. It contains zero tech firms. At a Japantown coffee shop, a friend remarks that there are about as many flood evacuees as there are Facebook employees. Most of them aren’t from here though, I think. Conquistadors, they came through to take. A coworker whose grandmother was evacuated complains of the gawkers in her neighborhood who pass by but don’t see the displaced. Instead, they snap cell phone photos of evacuees’ damaged furniture, the remains of their muddied strewn Polaroids. I project myself into an imaginary evacuee’s living room and imagine the loose pile of photos these strewn ones have floated from. Now there are photographs of photographs. Everyone with an iPhone is is a documentarian these days, I joke, concealing my own urge to capture things. When he steps out for lunch, I scroll through the photos tagged #SanJoseFlood on my Instagram. This essay isn’t a poetry of witness, I realize, it’s is a poetry of witnessing witnesses. One afternoon, dispatched by a local grassroots organization, my friends and I arrive at the Seven Trees Community Center with zine-making supplies to entertain 40+ child evacuees. The floods coincide with local schools’ winter breaks, a volunteer organizer tells me, and kids have been cooped up and restless all week. We find that the American Red Cross has taken over the operation. You can’t be here, the site director tells us, shooing us out of the dwelling. You could be pedophiles. We cannot even sort their donations without completing a certification process. Behind the director, a child in a Disney pajama set sips red see-through soup from a paper dish, gripping a canoe-shaped white dinner roll. It's as close as I get to connecting with an evacuee, and we don't even make any eye contact. On Facebook I post a living resident’s image of my deceased grandmother’s soaked neighborhood. The streams on her street make mirrors for the sky, with reflections of treetops and clouds rising midway up on the hubcaps on a line of parked cars. It has been 28 years since her death, and yet the present-day image still rattles me. Former San Jose residents on Facebook react to the photo with shock. CRAZY, says one far-off friend. Unbelievable, another. I note how the Internet shrinks, but never eliminates, the distance between all our poles. When I drive down my grandmother’s street three days later, the floods have subdued to damp concrete. Junk piles up high in some gutters. My grandparents were life-long orchard and cannery workers who moved to 16th Street in the 1960s. Today it is packed in with millionaires. On my Grandma Teresa’s death certificate, a clerk lists her profession as sorter. What I project on her lost reality is informed by that famous conveyor-belt scene from I Love Lucy. Instead of truffles, I picture her spry fingers plucking bruised pears from the fresh ones that were destined to sink into syrup in tins. Today in what once was her part of town, volunteers in Dayglo green t-shirts wear gloves as they parse through her would-be neighbors’ belongings. Five months before Grandma Teresa was born, a number of creeks broke their boundaries, making vast oceans across the South Bay. Every street in Campbell was a major torrent, one paper reports, and Alviso was the center of a great inland sea. In San Jose, 200 families were torn from their hearths, with a square mile of city property one to ten feet underwater. Marooned residents called out for help by firing their revolvers and guns. Poultry and pets met their ends in swift tides and outhouses, bridges, barns, fences, and roads washed away. Photos show streams in the road as deep as the beds of patrol wagons. The affixed horses were swept from their feet and forced to swim in the currents. I can imagine their swift treading fetlocks, their hooves cutting through muddy clouds. On an Alviso farmer’s land, flood waters unearthed buried humans. The newspaper describes the Ohlone graveyard as unknown to the oldest residents of the county. Mostly intact, the unsettled corpses filled redwood-hewn coffins, with trinkets, shell necklaces, and weapons inside. In nearby Watsonville, where some blood of mine lived, the entire business district lay drowning. Merchants’ families were inmates in their homes’ upper stories, waiting for floods to subside. Farmers lacked news of young trees in their orchards for days. The cells that would yield Grandma Teresa were in utero then. I project myself onto her mother, Mariana, a 42-year-old Azorean immigrant. Grandma Teresa would become the last of 10 children my great grandmother bore between 1896 and 1911. I project how these kids blurred together, noting a pair of babies called Joseph and Josephine born 16 months apart. Another pair: Antonia and Anthony. Having never birthed children myself, I text three loved ones this message: Do you feel aware in any way of the amniotic fluid when you’re pregnant? Two respond back that, while you can feel movement within you before then, the water breaking is most like a flood. One describes it as a sweet-smelling flash flood, while the other calls it kinda like peeing with no physical sensation that it is happening, just warm fluids. She signs off the message with a surfer emoji. Using an online pregnancy calculator, I determine that Mariana was around 13 weeks pregnant at the time of the 1911 flood: 4 weeks too soon to feel my grandmother’s movement. According to a Baby and Fruit Size Chart I find on the Internet, my grandmother’s fetus was then roughly the size of a peapod. I picture my tinier self positioned behind a TV tray, shelling peas into a mixing bowl while Magnum P.I. plays on the wood console television. It is likely a mash-up of many memories, some mine, some passed down from my cousins. I am in her living room, in a house that still stands in the present-day waterlogged neighborhood. My grandmother’s eldest sister, Mary, was 15 at the time of the flood. She could find water with a divining rod, some relative once told me, though I don’t recall who. All of her powers, I project, were water-related. To feel closer to this woman who died before I was born, I watch a YouTube video called Water Witching 101. A woman in a beige cowl neck top says water witches are people who can find underground water using what we call divining rods. I imagine introducing myself this way: Hello, I am Leslie Patron, descended of water witches. I try to feel an affinity for the video’s narrator, whose father is a water witch, but there's no bond between us. I read that the unseeable force that guides the rods is identical to what steers a Ouija Board’s heart-shaped planchette. As a child, I was not permitted a Ouija Board. Would I have been handed a divining rod? In July of 1964, in what the Ukiah Daily Journal calls a weekend drowning tragedy, the sea claimed the lives of two of Great Aunt Mary’s granddaughters, her son, his wife, and his father-in-law. According our family’s lore, Mary foresaw their small corpses in her mind before investigators identified them. Drifting ashore, the bodies of the girls, Stacey Ann, 7, and Sandy, 4, were clad in bathing suits. A second newspaper article calls the smaller child Candy, and some online ancestry records say Landy. Distant from their lifetimes, I am at a loss for which name is correct. Stacey was wearing two life preservers and her sister one, says the paper. I Google search life preservers and am surprised to see circles, not vests. I project myself into my progenitors’ shoes, who doubtless projected themselves into the girls’ last living moments, trying to sort out the inflatables. Some crises strike our communities in patches, with broad swaths of neighbors unable to ever relate. Whose role is it to document, and whose role is it relieve? Some tragedies struck at our progenitors, and a hundred years later we have no recollection of how. Their secrets died out when their memories were dragged from our shores. LESLIE PATRON is a writer from San Jose, California. Her writing has recently appeared in littletell, Entropy, Weird Sister, The Operating System, Harp & Altar, and others. This year, she self-published a book-length lyric essay called MOBS: A History of St. James Park. 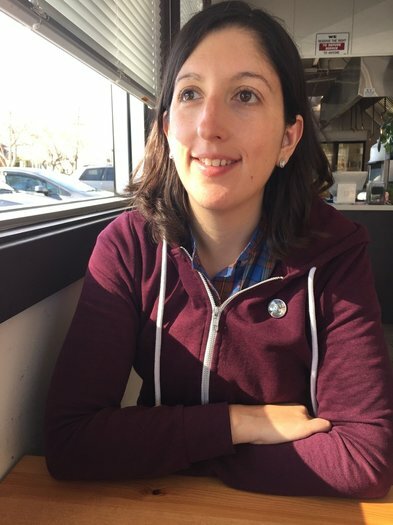 She is the social media editor of 1913 Press and an active member of the San Jose zine community.